The easier the recipe, the better, in my opinion! One reason I love making overnight breakfast casseroles is because they are so darn easy to make. You can prep them the night before and pop them in the oven in the morning. And who doesn’t love a little bit of sweetness to start the day? 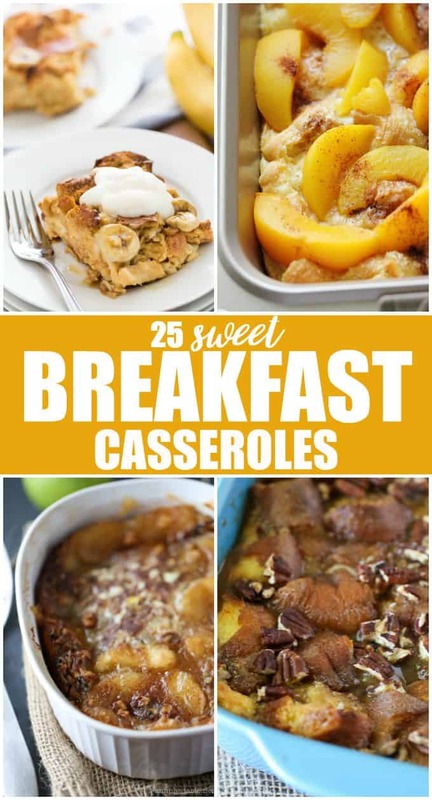 If you’re like me, then you’ll love these sweet overnight breakfast casseroles I’ve found. A few of them are my recipes and then I have a bunch from my fellow bloggers. They all look so delicious and can’t wait to try them out for breakfast with my family. Check out all the yumminess below! Which sweet overnight breakfast casserole do you want to make first? Thanks for sharing such a wonderful selection of recipes,now to decide which one to make first. This list is amazing. I want to try them all. Haven’t had breakfast casseroles before, very cool idea. Nutritious and filling breakfast. I can’t tell which recipe is pictured up top with the peaches?? I love peaches and overnight casseroles. That’s my Wife Saver Breakfast! I think I want to try the Apple Pie French Toast Casserole. Yum. The Caramel Pecan Breakfast Casserole caught my eye. Looks deadly but delicious. These all sound so good. I guess I would first try the Apple Pie french toast casserole. I love these. I always try a new one for our Christmas morning breakfast.